Thank you for visiting the official website of Pappas Development. DeKalb County is our home and has been for more than 50 years. We’re so glad you are interested in our hometown communities. Our commercial properties are strategically located for success. We’ll match your needs with our diverse portfolio of commercial properties. Those looking for a new home, look no further. Pappas Development will be offering luxury furnished apartments, with a Business Center, Hospitality Room, Fitness Center and much more, in downtown DeKalb at the new Cornerstone Development, midsummer of 2018. Please visit the Cornerstone DeKalb website now to learn more! The Pappas family has lived in the DeKalb/Sycamore area for more than 50 years. Pappas Development has developed properties for Northern Illinois University as well as throughout the DeKalb/Sycamore area over the past 30 years. They are invested in the community and they believe in the opportunity found here. Pappas Development’s portfolio includes the commercial development at the corner of Rt.23 and Bethany Road, the commercial development at Rt. 23 and Foxpointe Dr. and two retail/office complexes at Midlands Professional Campus. Pappas Development has redeveloped the former K-Mart into the Hy-Vee Shopping Center which brought new jobs, new businesses, increased sales tax, property tax and revenue to the area. Also in Sycamore, Pappas Development purchased the old Fargo Motors building at the edge of downtown and redeveloped that into a beautiful Business Center with apartments on the second floor. 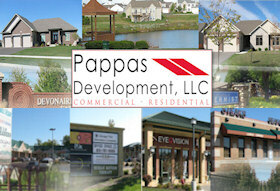 Pappas Development has also developed two strip malls near the corner of Rt 23 and Peace Rd, on Sycamore’s north side. Recently, Pappas Development redeveloped the old Fargo Hotel into luxury downtown apartments that were immediately rented out. In DeKalb, directly across from the Wal-Mart main entrance, Pappas Development has now developed and leased several shopping areas including AT&T Mobile, Advanced Auto Parts, Dental Fields, and one of the area’s newest, best restaurants, Ellwood Steak and Fish House. Please view our complete Portfolio here! Browse through our website, check out our Portfolio, and let us know how we can help you. Yes, we still use the telephone and face-to-face communications. Actually, we prefer it. We are real people here at Pappas Development and so are you.